for attractive, efficient, and safe bicycle travel. We find that the city of Munich is not doing enough to promote cycling and ensure the safety of cyclists. Whether the bicycle as an alternative to the car prevails stands and falls with the existing infrastructure: Only where protected bike paths are available can all people switch to a bicycle and feel safe. At the moment, however, the cycling network in Munich is in bad shape: paths are often in poor condition, far too narrow, uneven, bumpy from tree roots, not cleared in winter, and otherwise full of parked cars and thus unusable. We ask for an infrastructure that guarantees safety and comfort for all road users – for children, families, and retirees, as well as for daily commuters, occasional cyclists, and athletes. An infrastructure that is so good, that people want to use it — without being required to. Core elements of this infrastructure are protected cycle paths, which are structurally separated from motorized traffic on busy roads. A sufficient width, double curbs, bollards, and colored markings serve to convey safety on the bike paths. Infrastructure designed for practical and safe riding allows people to cycle side-by-side in conversation, and even to overtake one another without having to dodge into the high-speed motorized traffic. Bike lanes must also accommodate cargo and delivery bicycles as well as bicycle trailers, and they must provide space for people on bicycles to travel at different speeds. In terms of maintenance and servicing, cycling infrastructure must be given the same priority as motor vehicle roads: bike paths need to be quickly cleared of snow and leaves, potholes and bumps are unacceptable. Construction sites must be accompanied by sensible traffic routing which takes bicycle traffic seriously. Bicycle paths may not be misused as parking areas for cars: they must be protected either by physical structures such as bollards, or by the police and public order offices taking action. so that anyone can use a bicycle to get from A to B quickly. The bicycle is already often quicker than a car or public transport: particularly for short distances, there is no faster means of transport within the city. A dedicated bike network will take advantage of this fact and allow more people to travel longer distances in a shorter time. Today, there are no continuous routes in Munich. Especially in the city center, where many people travel by bicycle, cycle paths suddenly end in dense traffic. Many people would like to travel more often by bike, but evasive maneuvers to dodge unexpected parked cars, impractical bus stops, or closely passing cars are much too dangerous. 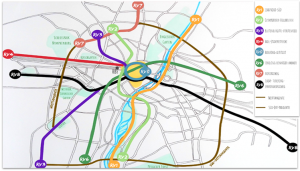 Munich needs a complete bike priority network in which the bicycle is given the right of way. The routes of this network consist of smooth, interconnected cycling paths. Wherever possible, stops at traffic lights and intersections must be avoided to ensure rapid progress and minimize lost time. Pictograms and colored markings allow easy differentiation from other traffic streams. All routes are designed for heavy and growing traffic volume. They are often away from heavily-motorized areas and provide direct beeline connections between district centers. They will allow comfortable and safe travel on continuous routes throughout the city. so that everyone in Munich can reach their destinations safely. Anyone who cycles knows the anxious moments at intersections and junctions — does that turning car driver see me or not? You keep your hands on the brakes just in case you have to avoid a tragic accident. The problems here range from a lack of attention on the car driver’s side to a poorly-structured intersection with limited visibility down the cycle path. Often, motorists will find it difficult to spot a moving bicycle behind a row of parked cars, and because of the impatient traffic behind them, they simply turn quickly. Hoping that nobody comes along, and if someone does, why a cyclist can surely brake in time! At dangerous spots like this, parking spaces near a junction must be eliminated to improve sight lines for all road users. Another useful preventive and protective measure for all parties involved is to build structures at junctions and intersections that only allow motor vehicles to turn at walking speed. Bicycle traffic lights that include a yellow light. This “structural” change allows bicycle traffic to be switched separately and not, as is common today, given a red light together with the pedestrians, while the motor vehicle traffic has an even longer green light. In addition to poor visibility, unfair traffic signaling also harbors potential conflict and danger. There are too few bicycle lights in Munich in general. Signalling bicycles simultaneously with pedestrians represents a disadvantage and hinders the flow of bicycle traffic. Sometimes a car traffic light is still green for up to 10 seconds longer than a pedestrian traffic light – which makes perfect sense for pedestrians, but forces cyclists to stop unnecessarily. For cyclists, a stop is much more impractical than for motor vehicles, because they have to laboriously reach momentum again with their own muscle power. Therefore, the expansion of separate bicycle lights with a yellow phase is needed, not just like pedestrian lights with red and green. Positive examples from other countries include a countdown of the remaining seconds or a blinking pedestrian or bicycle symbol, which indicates that the traffic light will soon change. Uneven curb edges and cobblestones are in terrible shape in many secondary streets and entranceways. A bicycle is shaken and jarred, like trotting with a pony – you can feel like you’re riding a city bike down a country road. These uneven surfaces are dangerous for people on bicycles: the ground itself requires so much attention that you have less attention left for other traffic participants. A failed attempt to dodge a ridge can cause an accident. And it’s just no fun. An example is the stretch from Tübinger Straße – Zschokkestraße – Gotthardstraße. 17 of 23 intersections and entranceways are small hurdles. Intersections in Munich are often very hectic. As soon as the light turns green, everyone tries to get out of the gate as fast as possible. Unfortunately, some road users – and often the more vulnerable ones like pedestrians and cyclists – are overlooked, and there is a risk of accidents with serious injuries. Bike boxes in front of the cars at traffic lights can help remedy this situation, while buffer zones for the turning traffic are an additional solution. 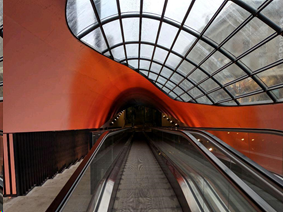 The city of Copenhagen has paved the way here for us too. This video by Nick Falbo, a traffic planner from Portland, Oregon, USA, demonstrates the basic problem and a sensible solution. so that everyone knows they can quickly park a bike and it will still be there when they come back. Protected from wind and weather, well-lit so people feel safe there, there where it’s needed, easy to reach while rolling a bike, with enough space so it’s not always full, and with additional services like charging for e-bikes or a spare tire vending machine. Protected: Bicycles must be protected from weather, theft, and vandalism. What is needed is covered and guarded bicycle parking, where the vehicle can be locked to something stable. Convenient: Good storage facilities, such as at the Pasinger station, are few and far between. 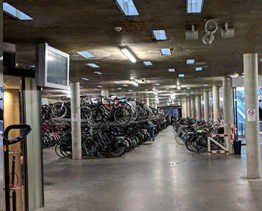 Underground garages and public transportation hubs like train and S-Bahn stations – wherever many people could switch from a bicycle to another means of transport – have the greatest need. Basically, adequate space must be implemented across the board. This takes up room, which must be planned — including in new residential or commercial construction projects. If necessary, instead of car parking spaces. Easily accessible: so that anyone and everyone can take advantage of the spots, the storage facilities must be easily accessible. That means: reasonably signposted and barrier-free. With additional services: Ideally, bicycle parking is combined with useful services, such charging stations for e-bikes as well as maintenance and repair stations. With enough space: There must also be enough space for cargo bikes and child trailers. What sort of bicycle facilities should we have? As so often when we discuss cycling, there are great examples in the Netherlands. Here, for example, the bicycle parking garage in Eindhoven’s downtown: modern design, guarded, and free of charge. so that the bicycle in Munich has its fair share. The public space in Munich is limited. Cars, public transport, people on bicycles and pedestrians all compete for space. The available space should be distributed efficiently. Public transportation, cycling, and pedestrians are all space-efficient. They are not given enough space proportional to their efficiency. Cyclists and pedestrian traffic have a distinct advantage when they can travel directly and without detours. For Munich, the motto “City of short distances” has long been a guiding principle in traffic planning. For these reasons, we want to redesignate current vehicle lanes or car parking to slow motor vehicle traffic, but not at the expense of space for pedestrian traffic, for public transport, or urban vegetation. To implement a socially fair distribution of the available space, we must consider those who genuinely need extra space. These are for example emergency services, nursing services, and tradesmen. How can we ensure that these groups can continue to do their jobs? Who needs special permits? Here we need a discussion in our society that also dares to change existing federal laws. This cannot be the task of the Munich Bicycle Referendum, because these problems already occur at every rush hour, quite independent of our current rates of bicycle traffic. The Referendum is designed to make cycling so attractive that many people recognize that it’s a more comfortable, healthier, more relaxed, faster, cheaper, and more reliable alternative to a private motorized vehicle. Each automobile takes up the space of 4 bicycles. Every second car trip is shorter than 5 kilometers. That is our greatest potential for shifting traffic. When the goals of the Referendum have been implemented, there will automatically be fewer cars because people are pragmatic and flexible. In contrast, building more car roads attracts more car traffic. We see that every day on Munich’s streets. We prefer to build cycle paths and attract bicycle traffic. Please support us with a donation and help make the referendum a success. Your signature helps us get closer to our goal. You want to do your part to make the Bicycle Referendum successful? Join and support us with your organization! Help spread the word of the referendum and follow us on social media.